Grave marker, called the Lechmere stone. 1'8'' in height, and 11'' in width. Grave marker known as the Lechmere stone. The stone has a carving of Christ in Majesty. 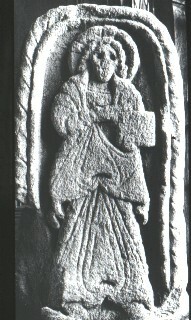 Christ is standing and is holding a book in his left hand. His head is haloed and he has a pointed beard. He is robed in an under and an upper dress. Brown, G.B., The Arts in Early England, 6 Vols. 1st, Oahspe, Herts. (1903-37) Art, Anglo-Saxons, England, Civilisation..